The man we called Lemml, introduced the rest of the cast, as they twirled, bounced and sprung across stage. Some played couples and showcased their love to the audience through actions of affection by dancing and flinging around the stage together. Even the violin player spun around the performers and joined in the dance. It reminded me of every Nicholas sparks novel, as he described love as passionate and boisterous. It was a pleasing visual, and the performers were remarkably convincing. 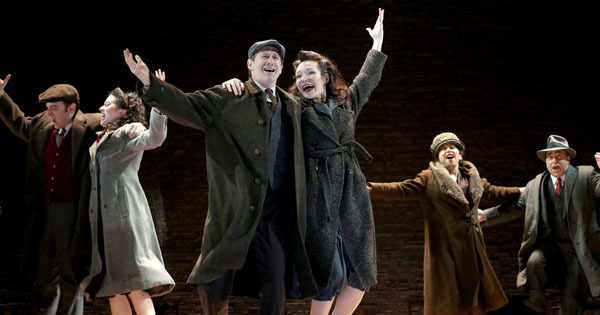 Max Gordon Moore, Adina Verson, Richard Topol, Katrina Lenk, Mimi Lieber and Steven Rattazzi in INDECENT, a new play by Paula Vogel, co-created by Paula Vogel and Rebecca Taichman, and directed by Rebecca Taichman, at the Cort Theatre, 138 West 48th Street. For the next hour and forty minutes, we were taken by excitement, sadness, passion and a myriad of other reactions as we witnessed the history of Sholem Asch’s 1907 Yiddish play God of Vengeance. It told the controversial story of a Jewish brothel owner who bribes a rabbi so that the rabbi’s son will marry his daughter who is taken by a perplexing older woman. Much can be said about the play itself. The God of Vengeance is seductively controversial, and yet ahead of its time as we think this play was created in 1907, but is performed in 2017, a time where lesbians are accepted and celebrated. 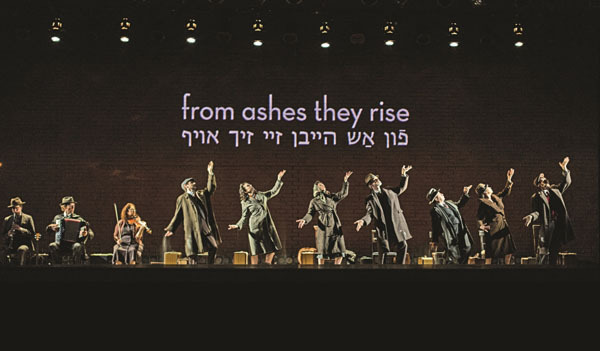 Indecent traces the history of the play from its first reading in a Jewish salon in Warsaw to the stages of Berlin, and eventually international fame to its opprobrium. 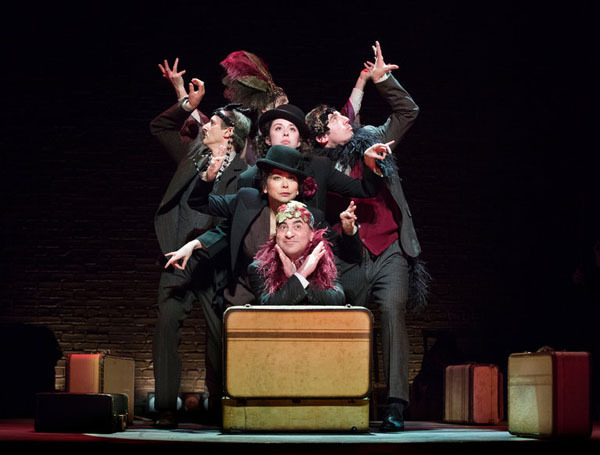 A mixture of song and dance incorporated in the play provided an uplifting accent, and helped sell the emotions of the characters, while presenting a striking visual. Throughout the play, words were projected onto the background, to let the audience know what’s happening, what year it was, where they were and when a transition was occurring. At one point, the characters would perform the same scene, eight times in a row, to show them performing in different cities. To make it more interesting, the characters would rush around stage, speaking the same lines, the same actions, and every time, it would speed up, like when you rewind or fast forward a tape. A noteworthy mark to add was the blink in time, where the words “A blink in time” would appear on the wall and the actors would become concrete statues, waiting for that chime to signal movement again. The perspectival high jinks and artful directions, fudged the distinction of 20 different characters, played by a mere 7 actors, to provoke us to imagine a relevance that didn’t exist. Yet, we found ourselves falling for the spirits of the characters and the flair of the performers. The infamous rain scene was mentioned all throughout the play, and when they finally revealed to us what that was, the audience sunk into their seats. It was beautiful, the first time they demonstrated it, but the second time, brought a tear to every single eye in that room. Set during the Holocaust, the characters would wait in long lines, waiting and waiting, not knowing what was to come. The narrator in the background voiced Lemml’s vision, of the girls escaping the long line. They rushed off stage, in sheer terror as they ran and dashed up the aisle, to only disappear behind the audience. Turning our attention back to the stage, we finally realize the purpose of the ashes. The ash began pouring from their coats again, and the audience watched in awe, as the realization of what happened hit them all at once, like a bowling ball smashing through brick. In this moment, the crowd was silent; people were wiping their faces, to erase the tears. In the last moments of the performance, Asch was consumed with sorrow as he prepared to leave Staten Island to go home. The discontent he felt towards the play he wrote consumed him, it consumed all of us. But, at the very end, a spark of hope ignited as he visualised the rain scene. The two ladies appeared on stage, dressed in long white gowns, pivoting around, dancing as the water poured from the sky. They were happy, and in love, which provoked a smile on Asch’s face as he realized the good in the play. It was a haunting touch, but it brought the audience to their feet, cheering and clapping ever so loudly as the actors took their well-deserved bows on stage. 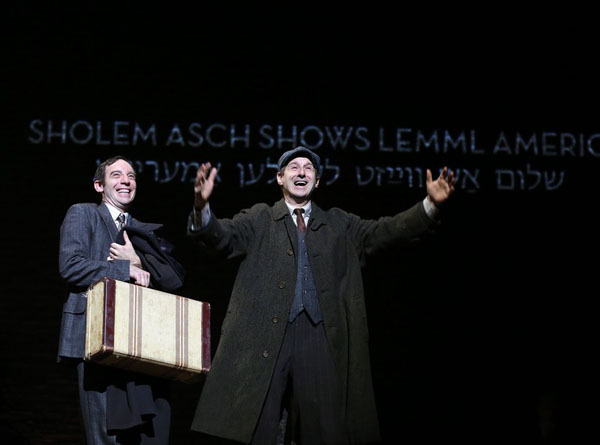 Max Gordon Moore as Sholem Asch and Richard Topol as Lemml in INDECENT, a new play by Paula Vogel, co-created by Paula Vogel and Rebecca Taichman, and directed by Rebecca Taichman, at the Cort Theatre, 138 West 48th Street.